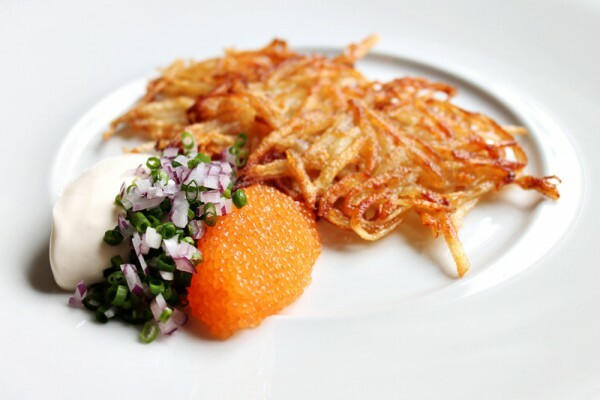 Try this great recipe for the Swedish classic dish Rårakor or Swedish Hash Browns, grated fried potatoes served with bleak roe, sour cream and onions. 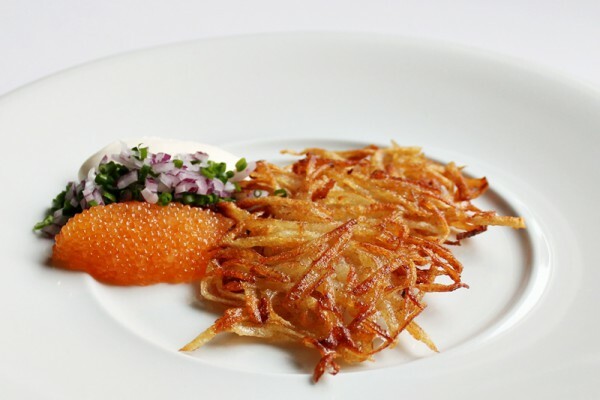 This dish is well known in Sweden and are called “Rårakor” and they are absolutely fabulous. They are usually served at restaurants with roe, sour cream and freshly chopped onions the way I do in this recipe. The name for the potato part of the dish translates to Hash Browns so I decided to call them that since this is suppose to be an English written food website. However, they don’t look or taste anything like the hash browns I’ve tried. Anyway the name is not important, the taste is everything. Rårakor or hash browns are more often served as a rustic main course with salted fried pork and lingonberries that´s an truly amazing dish. If you’re ever in Sweden it’s a must try. 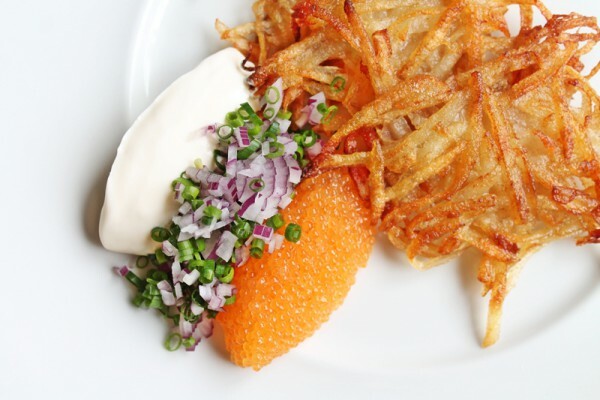 This way with the roe is a bit more elegant and I think it’s better suited as a tapas or appetizer. For the roe I used a fairly cheap American bleak roe which is fine but the king of roe is the Kalix bleak roe from the north of Sweden which I think is the best one in the world, Russian and Iranian caviar included. The Kalix one has smaller eggs and is more red in color and the flavor is more elegant, once again if you get a chance to try it don’t hesitate. Chop the chives and red onion and combine. If the roe is very wet you need to let it drip of some of the liquid. Put it in a coffee filter and let it drip of for an hour or two. You want it to be dry enough to be able to shape an egg using a wet spoon. Peel the potatoes, melt butter in a pan on medium heat. Grate the potato and put a spoonful of potato in the butter for each pancake, flatten it out into a pancake and fry until golden, season with salt and pepper. Flip the pancake and fry until golden on the other side. Plate the sour cream, onions and roe and put the pancake on the side. Serve immediately. The pancake should be crispy on both sides but not all the way through. If you´ve never tried this before then make a few practice ones before your guests arrive so they will be great when it’s time for serving.